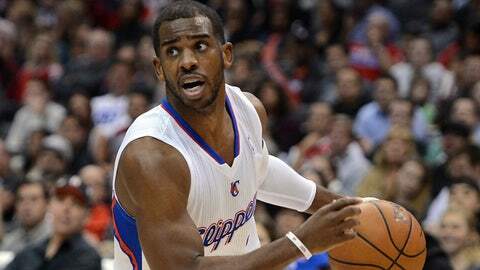 In 34 games, Chris Paul averaged 19.6 points, a league-leading 11.2 assists, 4.6 rebounds and 2.4 steals per game. If the Clippers were hoping for some good news about Chris Paul, they didn’t get it Sunday after the point guard was evaluated by team doctors and underwent an MRI on his right shoulder. The team said Paul was diagnosed with a Grace 3 joint separation and will be sidelined for up to six weeks. If there’s a silver lining in all this, it’s that he won’t need surgery. Paul was hurt Friday night in Dallas when he was driving around a screen and was knocked off his feet by Mavericks guard Monte Ellis. He left the court immediately and wore a sling after the game. There’s little question Paul was having an MVP-worthy season through the season’s first two months. In 34 games, he averaged 19.6 points, a league-leading 11.2 assists, 4.6 rebounds and 2.4 steals per game. Darren Collison has replaced Paul in the lineup, and the Clippers waived Maalik Wayns earlier Sunday, an indication they plan to fill the open roster spot with another point guard. Wayns might have been given a shot at the job, but he hasn’t fully recovered from a torn left meniscus.